With a sophisticated and contemporary decor, this elegant space includes 128 accommodations, six restaurants with national and international cuisine, four bars and all the luxury amenities to guarantee fun, and tranquility. Experience your perfect romantic getaway by the beach at this adults-only hotel located in Rivera Maya. El Dorado Maroma’s astonishing Gourmet Inclusive® concept provides you with luxury benefits creating the ideal place for a dreamy vacation. On renowned Maroma beach in Mexico’s Riviera Maya, El Dorado Maroma, a Beachfront Resort, by Karisma provides a secluded, enchanting setting for those looking to escape. Amidst the gorgeous Caribbean surroundings, this intimate resort with just 74 suites, is perfect for romantic getaways, destination weddings and sensational honeymoons. Caribbean Grill Restaurant & Terrace: Sit back and enjoy the Caribbean lifestyle at this contemporary venue. Our chefs create Mexican Caribbean delights in avant-garde style infusing the freshest local tropical ingredients. Enjoy the breeze on our open air terrace. Experience a relaxing dinner or celebrate a special moment with friends at the Chef’s table. Mexican Caribbean Cuisine. Dinner: 5:30 pm to 10 pm. New Joe’s Bar & Lounge: Self-service bar located beachfront on the second level of Lima Limon restaurant, Joe’s lounge offers premium amenities in the comfort and convenience of a luxurious living area. Enjoy savory hors d’oeuvres, refreshing beverages and our wide selection of house wines surrounded by breathtaking views, plush intimate seating and natural tones. Hours: 3 pm to 11 pm. Dinner: Ladies: Dresses, skirts, long pants, shoes, Capri pants and elegant sandals. Gentleman: Long pants, collared shirts and casual shoes. Permitted: Formal Bermudas and formal sandals. Not Permitted: Baseball caps, peaks, tank tops & flip-flops and sport shorts. Breakfast and Lunch: Ladies: Sun dresses, elegant sandals, T-shirts and skirts. Permitted: Shorts, T-shirts, flip flops. Gentlemen: Long pants, formal Bermudas, polo shirts, sleeved T-shirts, sandals and tennis shoes. Permitted: Shorts, sleeved T-shirts, flip flops. Not Permitted: Swimming suites, bikinis, tank tops, sleeveless shirts, baseball caps or any type of hat. 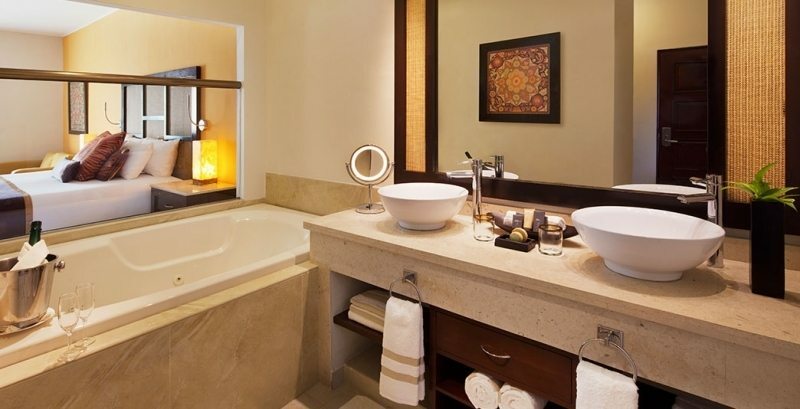 Relaxing Hot Tub Junior Suite: Relax in these intimate and romantic suites located near the main pool and swim-up bar. Every suite comes complete with a king-size bed or two double beds, marble top bathroom with double sink, spacious closets, Relaxing Hot Tub and LCD TV with satellite service. This beautifully furnished suite features a relaxing balcony daybed and an indoor Relaxing Hot Tub for two. Room Size: 405 sq. ft. Maximum occupancy: 2 guests. Honeymoon Suite: The resort’s main pool is waiting right outside your suite’s sliding doors. Hop right in and wade up to the swim-up bar whenever you’d like. This elegantly appointed suite features an outdoor terrace with a double bed, our signature Aguas del Amor™ outdoor shower and a personal indoor Relaxing Hot Tub. These suites offer a comfortable living area and a private deck with beautiful views of the Caribbean. Room Size: 558 sq. ft. Maximum occupancy: 2 guests. Mi Hotelito Beachfront Suite: This romantic suite is elegantly appointed, yet the most amazing decoration is the lush Caribbean foliage. Every suite offers a king-sized bed, an oversized terrace, and direct access to the main pool and Bar 24. Plus, you’re just steps away from the beautiful Maroma Beach. Room Size: 276 sq. ft. Maximum occupancy: 2 guests. Royal Suite: The Royal Suites are designed with couples in mind, with romantic décor, and a fully furnished terrace where you can enjoy premium mixed cocktails from your own liquor cabinet filled with whisky, vodka, tequila and rum. Love is in the air and magical moments abound in the luxurious, contemporary Honeymoon suite, complete with a separate living room. Unwind in the king-size bed, relax on the private deck and in-suite Relaxing Hot Tub and reinvigorate in our signature Aguas del Amor™ outdoor shower. Every suite is back dropped by the beautiful Caribbean scenery. Designed with luxury in mind, these suites include a stocked liquor cabinet with your favorite spirits. Size: 405 sq. ft. Maximum occupancy: 2 guests. Private Pool Relaxing Hot Tub: Relax in your own infinity pool as you enjoy stunning garden and ocean views. Every suite includes a Relaxing Hot Tub for two, our signature Aguas del Amor™ outdoor shower, and a terrace with a lounging bed. Unwind in this plush suite with your own private pool and a Relaxing Hot Tub for two. Size: 558 sq. ft. Maximum occupancy: 2 guests. Swim-Up Relaxing Hot Tub Suite: The resort’s main pool is waiting right outside your suite’s sliding doors. Hop right in and wade up to the swim-up bar whenever you’d like. This elegantly appointed suite features an outdoor terrace with a double bed, our signature Aguas del Amor™ outdoor shower and a personal indoor Relaxing Hot Tub. Room Size: 558 sq. ft. Maximum occupancy: 3 guests. Royal Swim Up Suite: Just beyond your suite’s back doors, you’ll find the stunning resort pool. Walk right in from your patio and wade towards the main pool area and swim-up bar. Couples will love our signature Aguas del Amor™ outdoor shower for two, designed and built for romance. The fully furnished terrace comes with amazing views and a private liquor cabinet is filled with your favorite whisky, vodka, tequila and rum. Slip into the pool that passes by your patio. Follow the path that leads you all the way down to the main pool area. Size: 588 sq. ft. Maximum Occupancy: 2 guests. Presidential Studio: Lush tropical gardens surround your senses in the Presidential Studio. Relax in the comfort and style of your spacious living area, take a dip in your ample pool, or unwind in your plush bedroom. Wake up to lush tropical gardens from the comfort of your luxurious bedroom. Size: 1,227 sq. ft. Maximum occupancy: 2 guests. Honeymoon Villa: This is truly your home away from home with a little extra, of course. These comfortable and elegant Villas provide you modern gourmet kitchen, marble bar with premium drinks, and an oversized terrace with access to your private tropical garden and swimming pool. Villas feature a modern gourmet kitchen and marble bar – the ideal home away from home. Size: 1,996 sq. ft. Maximum Occupancy: 2 guests.